The Dirty Robot is a unique synthesiser emulation pedal for guitar and bass. Two different synth voices are at your disposal for creating wild sound textures using a standard guitar or bass without the need for any special pickup. V1 gives you warm analog synthesis with subtle to extreme envelope sweeps just like classic synths from the undefined’s and 80s. V2 provides a vocal formant synthesis effect that can be used for vocoder emulation or talk box style effects. Using the Dirty Robot’s exclusive 360 degrees Drift knob, you can blend between Square, Octave, and Sub synthesis soundscapes. The built-in chorus and vibrato effects give Dirty Robot unparalleled versatility and make having one the next best thing to putting an actual guitar synth on your pedalboard. The Dirty Robot’s effects are complimented by stereo ¼” inputs and outputs for routing flexibility, constant high voltage rails, a bi-colour status LED indicator and true bypass circuitry. 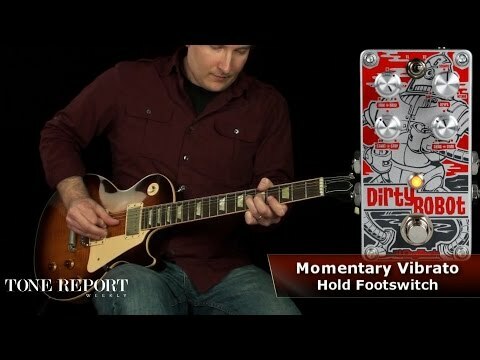 With its compact size, vacuum-style foot-switch and striking graphics the Dirty Robot furthers DigiTech’s evolution in pedal design. Buy Now: https://goo.gl/pCrM7x This is the Dirty Robot, from DigiTech. Those looking for a super-controllable synth pedal can call off the search, because the Dirty Robot offers everything you could want from a synth pedal in a compact package. The Robot's heart is comprised of two wildly different synth voices, V1 and V2. V1 is a traditional envelope-style synthesis, while V2 is a vocal formant type synth. After selecting the mode, the Drift knob selects the waveform from Square, Sub and Octave forms, with the ability to mix adjacent waveforms. The Dirty Robot features a powerful filter control, with an exhaustive feature set. A Start and Stop concentric pot controls the starting and stopping frequency of the filter sweep in V1 mode, and vocal formant sweep range in V2, while the Sens and Time pots sets filter trigger sensitivity and the time taken to sweep between Start and Stop knob settings. A handy Mix knob controls wet and dry signal balance, a major plus for bass players, and the Mod control mixes in a chorus ensemble effect to thicken the synthesis. When the footswitch is held while playing, it activates a vibrato setting, much like the mod wheel found on any synth worth its salt, and true stereo ins and outs allow for signal processing as innovative as the pedal itself.